I recently corresponded with Bob Worley of CLEAPSS in the U.K. He was hoping to make the common “brass penny” activity safer for students. You can read Bob Worley's blog post about brass pennies about the topic. He provides a link to a 1975 Journal of Education (JCE) article that was a feature, Chem13 News Digest, edited by R.J. Friesen. The part that Bob was interested in is “Brass”, authored by P.D. McCormick of Ontario. The author suggests using a spoonful of powdered zinc covered with 3 to 10 M NaOH in an evaporating dish. Copper tokens are added and the solution is heated until the token turns silver. 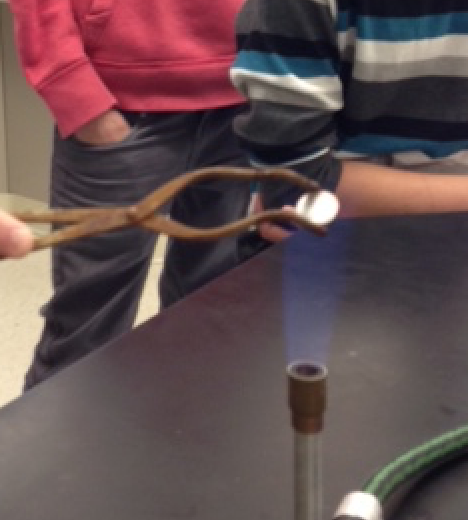 After rinsing and drying, the token is placed in a Bunsen burner flame. The copper of the token and the zinc coating mix to form the alloy, brass. Many of you have seen directions similar to this in labs with names like “Gold Pennies” and “Alchemy”. With some time in the lab, Bob did find that he could produce the same brass coating using a much lower concentration of NaOH. Thinking that the idea of using a lower NaOH concentration was an original idea, he was excited to share. But, with a little research, he found that the idea to use a lower concentration was actually published in a JCE (Robinson and Morris) article in 1994. The authors shared that they had used .5 M NaOH and replaced the Bunsen burner with a hot plate. I have used a procedure with the lower concentration of NaOH. We have also placed the zinc-coated coins on a hotplate with success, but I allow students to use the bunsen burner for the last step if they prefer (see the photo above). Of course, you can find numerous links online about making brass pennies. I took time to look through some of them and was surprised that the most common version I found used 6M NaOH and a procedure like the one outlined in the 1975 JCE article mentioned previously. Less than a week after Bob contacted me, a member of the NSTA chemistry listserv mentioned a similar activity she was using published as a Flinn ChemFax ,“Turning Copper Pennies into “Silver” and “Gold”! . This activity does not include the use of NaOH at all. A solution of ZnCl2 is used instead. I have not used this method, but I have heard that the zinc coating turns out to be a dull gray, rather than a silver color. On the other hand, I have also heard that after heating the zinc coated coin, the resulting brass coating is just as impressive as when using the NaOH procedure. If you have not made brass pennies yet, I encourage you to try the activity. It is something that your students will remember. Thanks to Bob Worley for all he does to help teachers find alternative and safer methods. Check out his website, Microchemuk. Note that zinc powder is extremely flammable. If you try any of these versions, you will want to read the safety and disposal guidelines for the specific chemicals used.